It’s always lovely to go on a long holiday to a far flung destination. There are times, however, when it’s not convenient or cost effective and a staycation, closer to home, is the way to go. The destinations in this series of posts are all within a couple of hours’ drive of our home. They’re easy to get to, there’s plenty to see and do and at the end of the holiday we’re home again in no time. 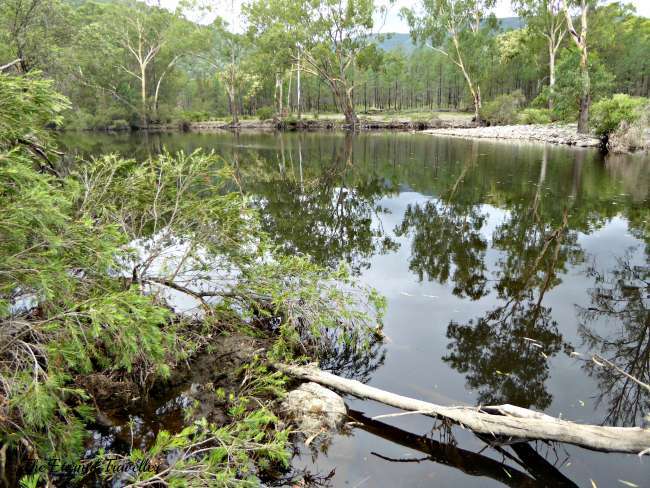 Sundown National Park, 45 kilometres south of Stanthorpe, is one of the more remote and inaccessible parks in south west Queensland. 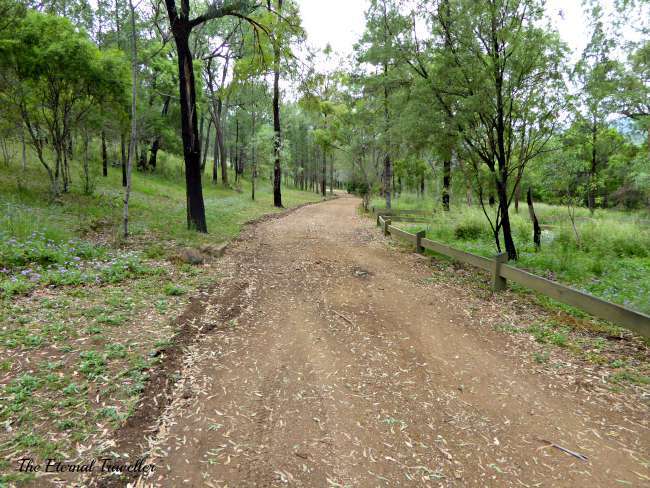 After leaving the New England Highway and travelling along Sundown Road, the dirt track into the park is four wheel drive only. Driving through open forest, with glimpses of the mountain range up ahead, we feel completely isolated; midweek, the road is empty except for a lone kangaroo almost hidden in the trees. It feels peaceful – until we open the car doors. Suddenly we’re assailed by a cacophony, high pitched and relentless. We’re not alone after all. It’s high summer and the insects are in full voice. 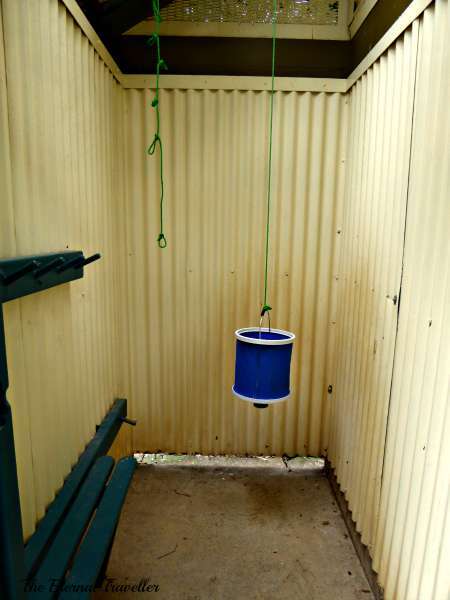 This park is set up for bush camping and the facilities at the Broadwater Camping Area are plentiful but primitive. There are pit toilets and showers; there’s even hot water if you start up the donkey boiler. After a picnic lunch, serenaded by the strident insect chorus, we walk along the bank of the Severn River to Red Rock Gorge. 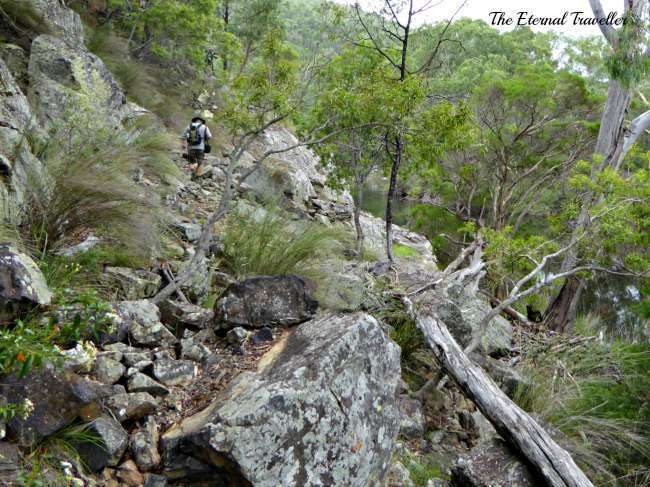 The track leading to the permanent waterhole in the gorge is only a kilometre long, but it’s steep and rocky and the walk takes nearly an hour. Permanent Waterhole is 5 metres at its deepest part and even in the most severe droughts it has never dried up. According to the information board wildlife is abundant but in the heat of the day nothing ventures out. On our return journey we discover the noise makers. Bush cicadas in their thousands, camouflaged on the tree trunks, are all calling to find a mate. The noise continues all day, only ceasing after the sun sets but by then we’ve left the park. The cicadas have the bush to themselves again. I agree that “staycations” are sometimes the best way to go. Last summer I took a staycation here in Oklahoma since finances were tight. We visited the state capitol building, a natural history museum, an animal skeleton museum (that was a bit odd), the local aquarium, the west Oklahoma salt flats and did a lot of cleaning/arranging at home. It was one of the most relaxing vacations ever. This year we did go out of state to New York, which was a lot of fun, but much more tiring! It’s nice to explore the local area for a change. Your staycation sounds like great fun. I’m intrigued by the skeleton museum. It sounds like something little boys would adore. It is a privately owned museum just south of Oklahoma City called the Museum of Osteology. It has hundreds of skeletons from around the world. Some are displayed in interesting ways, such as the raccoon skeleton holding a candy wrapper. The price is a bit more (about $15.00 per person) than I expected for a small museum, but it is definitely unique. Oh, a by the way, the cicadas are in full swing here too. I don’t think I could ever sleep outside: their singing is deafening. When you get a few together they make a din don’t they! Oh yes! The last time we went hiking, there were literally thousands in the air, on the ground and in the trees. My daughter did not think that was too exciting, she hiked through the trail as fast as she could! Oh, I wouldn’t like it much if they were all flying around. That would not be nice. These ones were all hiding on the trees. I am totally with your daughter. I hike that way when there are leeches on the ground. 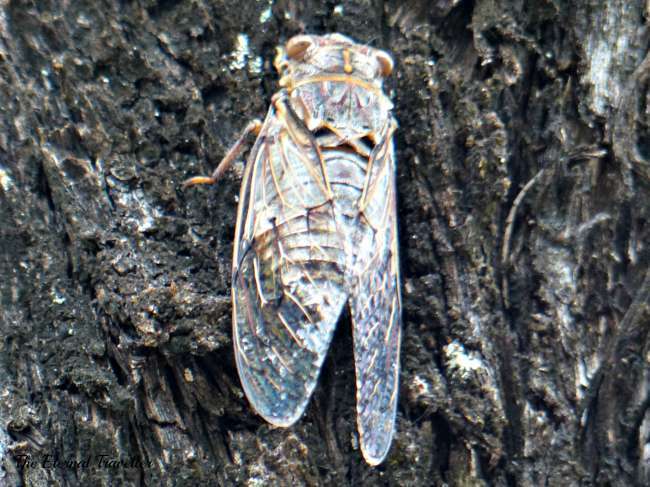 I love hearing the first cicada of the season. It’s a sure sign summer in on the way. But the noise these cicadas made was almost overwhelming. Yes, they can get VERY loud! Looks like a great place to visit, not sure about the showers though, haha. I reckon a donkey boiler shower would be better than no shower! Now I understand how a donkey boiler works! It’s an intriguing invention isn’t it. We don’t have a lot of cicadas here in the Northeast but when living in Kansas, I remember that sound well. For a short time it is okay, but over several days it becomes a torture of sorts. 🙂 I always enjoy primitive solutions to every day challenges. My husband likened the sound to torture too. It was relentless. They have the most incredible life cycle don’t they. And after all that time in the ground they only live for a short time in the trees. Apparently cicadas are the loudest insect, capable of reaching 100 decibels! They are not common over here, except in southern Europe. In the south of France they tend to hide themselves and stop their noise when approached. At least that was my experience. Ugly things aren’t they! These ones weren’t pretty but in summer we have very pretty green ones. I’ll take a photo for you when they start appearing. 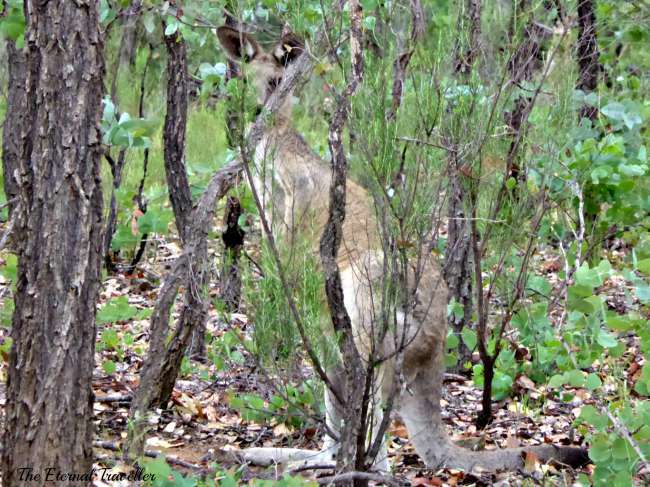 Any walk with a kangaroo in it (however shy) is alright by me. 🙂 The donkey boiler had me smiling though. We didn’t go close to him though. He was a big fellow, taller than me. I was glad I didn’t have to get the donkey boiler going. 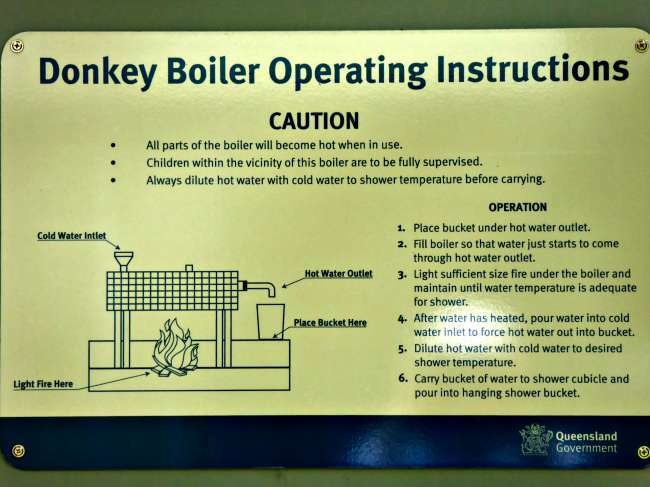 At first I wondered at the name ‘donkey boiler’, but when I scrolled down and saw the photo of the actual thing, I could see why! The track alongside the river looks as though it should definitely be taken carefully, and perhaps a bit of a challenge for ankles and knees? It must be nice to be so remote, though. We were the only people there all day. I suspect though it would be busy on the weekends, especially during holiday times. It was lovely to be there on our own. I think that would be the best bit – being all alone in the wilderness (but knowing that my car was there for getting away again!). 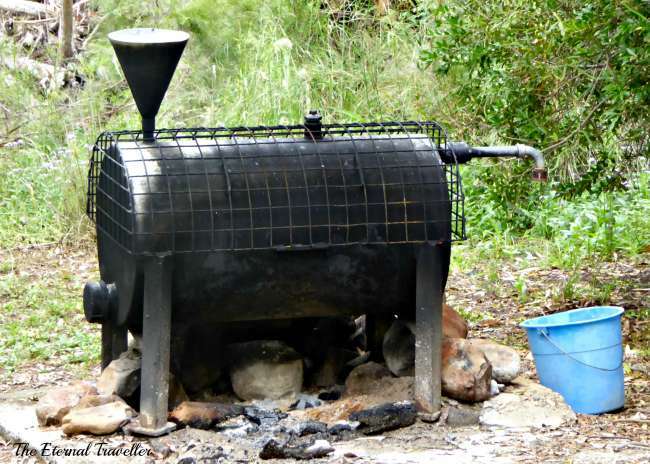 I’ve never seen a Donkey Boiler! Is it wrong to say but your photos remind me of Crocodile Dundee… that sort of wide landscape with not a soul in sight! I know what you mean. This is in southern Queensland and the movie was filmed in the Northern Territory but the vastness of the landscape is similar. I’m heading to Crocodile Dundee territory soon. Cool lovely photos & what a hike! Nice! No boardwalks here. It was up and down but well worth the effort. Ooh yes, I love that too!